Engineer Aleksandr Pavlovich Aleksandrov replaced Laveykin and became Taymir 2. For a long time I was sure that the communications of the cosmonauts and TsUP had more possibilities than VHF. Regularly they spoke about trackingships and geostationary comm. satellites. Those both sectors were for me challenges. I realized that adding that practice to my monitoring would enhance possibilities. But I still had a lot to find out and analyse and for that purpose I had 3 options. 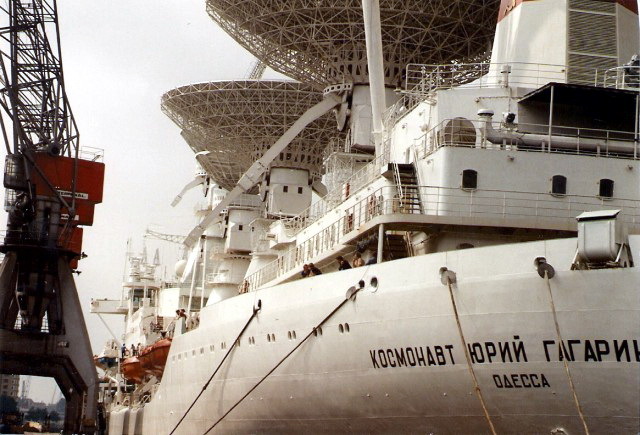 Often the cosmonauts had contacts via VHF-1 (UKW-1 143.625 Mcs) with people on board of the tracking ships who normally relayed communications with TsUP. It happened that such a ship already was in the range of me, but not yet in that of TsUP. Once I heard Aleksandr Volkov during a communication session with such a ship. Those discussions were friendly so not professional. Krikalyov even wrote a computer programm which contained a warning as soon as they came in range of TsUP and had to finish the conversation. I was able to able to receive the short wave maritime channels in Morsecode in Russian (a skill obtained by me during my naval carrier). I discovered that the wireless operators on board of those ships communicated with each other. They told that, for instance, their ship was bound for Rotterdam, Antwerp or Amsterdam. Those visits were to obtain water and/or provisions, but also to pick up old Dutch motorcars. Car dealers knew this and were ready as soon as such a ship arrived. From this radiotraffic I often could derive the number of cars which came on board. I also had the opportunity to visit those ships. In such cases I arranged a visit with the help of the ships agents who were responsible for the arrangements for those ships. This was not always easy and when I did not get permission I tried to arrange this myself with the ship’s crew. My knowledge of the Russian language was useful. For the travel to the ships I had my space flight friends, my broadcast colleagues or I went by train. The purpose of those visits was to collect as much as possible information about communication subjects, but also about political items. The destiny of those ships was unsure for there were always financial problems in the Soviet Union and later on in Russia. There existed also a competition with the geostationary comm. satellites and the system Luch. That system was already operational, but not always ready and suffered from malfunctions and other set-backs. Later on the Altair-satellites showed up. They had the Luch system on board and were placed in a position over 16 degrees West. An advantage was that those Altairs functioned well. When I spoke with people on board of the tracking ships they always were optimistic. They expected that at least it would last until the year 2000 before they would be withdrawn from service. I was not so optimistic and my intention was to concentrate myself on the geostationary satellites. 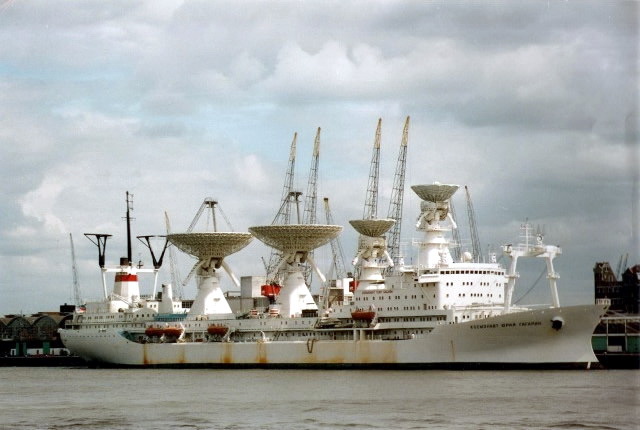 The tracking ships were operational until about July the 8th 1994. The tracking ship Kosmonavt Pavel Belyayev was for the last time en route to Sankt Peterburg and stayed for a short period in the harbour of Antwerp (Belgium). For me it was always easier in Belgium to get support to come on board than in the Netherlands. The Belgian ship’s agents were more flexible, their Dutch colleagues acted as bureaucrats and always found objections for they did not appreciate my interests in those ships. It was difficult to come on board. Transworld Marine was in charge of the handling of the ship’s affairs and I did not get permission, they even did not intermediate with the ship’s crew. Nevertheless I could arrange a meeting with the captain, but he did not give me permission either and handed me over to the first mate ‘comrade Popov’. ‘Первый помощник к трапу’ so the first mate had to come to the gangway. So I knew that the consul was there. With this consul I had a long conversation and as consul (undoubtedly also KGB-related) he was interested in me and he was not satisfied with my answer that I was only there as space flight freak. To avoid complicated questions I switched over to the history of the Netherlands using the period in which Russian Cossacks liberated our country by chasing away the French. 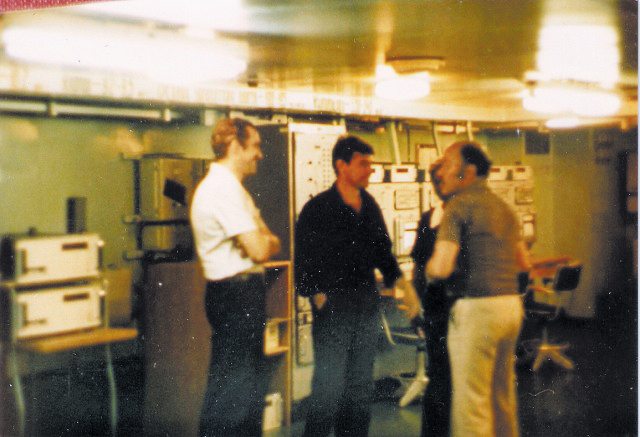 With my extended stories about those times and the anecdotes which I added I fatigued the consul in such a way that he at last gave ‘comrade Popov’ permission to show me the ship and speak with people on board. For me it was a pleasure to speak with the captain Georgiy Fyodorovich Grigoryev. Long before ‘glasnostj’ was generally accepted he already radiated that. He had a lot of questions for me and was even interested in the amount of my salary. He also was very interested in the opinion of the people in Rotterdam about his ship, for instance do they think that he and his crew were spies. The captain said good-bye to me for he had to take care for the fair contribution of the available places on the deck to stow motorcars for his crew. Comrade Popov was still there, but he could not answer my questions about space flight and the work of the so called Expedition on board and in his place came the chief of that expedition, Vadim Semyonovich Mamalygin. He gave me a guided tour through the ship. This was overwhelming. I myself had made an official journey with the Dutch weathership Cirrus, a former coast guard frigate, and also journeys via high seas, but the KYuG was a real colossus: 45000 Tons, 10 decks, hundreds of cabins and other rooms, for instance 3 swimming pools, a sports room, a theatre for more than 300 persons. There was also an operating room. The medical staff consisted of 3 physicians and a feldscher, so more or less a to a half physician sublimated nurse. The crew of more than 300 persons consisted of 2 parts: the people responsible for ship’s affairs and those that worked for the expedition, so the handling of space flight matters and communications. These two categories were sharply divided. The ship was the property of the Soviet Academy for Sciences in Moscow, but the home port was Odessa and the maritime control was the responsibility of the Black Sea fleet. Mamalygin and his staff almost never came into contact with people of TsUP and they also had no contacts or coordination with colleagues of the other tracking ships. They also did not know much about the ships belonging to the Baltic shipping. Mamalygin told me that there were never meetings between his people and space flight authorities, briefings did not take place at all. Instructions and information they became by letter or telegrams. There existed good contacts of cosmonauts with the ship’s crew and this yielded in good friendships. 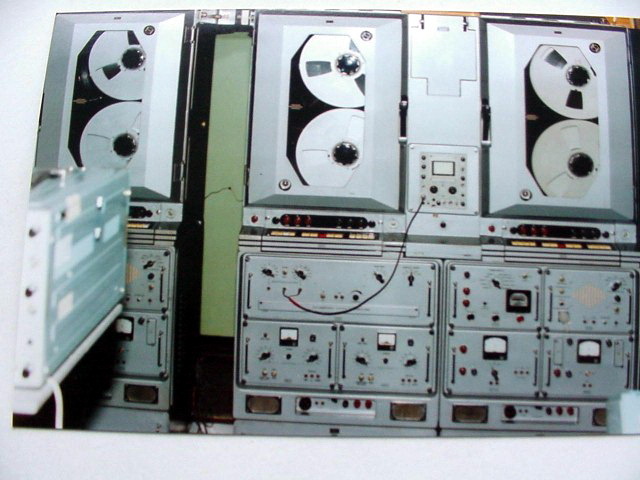 A short time before my visit I had heard how the cosmonauts communicated with KYuG and I hoped to visit the laboratory where these communications took place. Regretfully for me a lot of doors to these laboratories remained closed. Perhaps this was an achievement of the comrades consul and Popov! In spite of that I got a lot of interesting information. The 2 parabole-antennae at the back with a diameter of 25 Meters were able to transmit and receive signals with centrimeters and decimetres waves and were for the the control of deep space objects. The antennae with a diameter of 12 M were used for communications with TsUP via Molniya satellites and via geostationary satellites of the Luch series. So Mamalygin confirmed that Molniya satellites were used for communications with TsUP. It was clear that Mamalygin and his staff were worried about the competition of the geostationary satellites equipped with Luch systems, a lot of them still under the Kosmos description, such as Kosmos-1700, 1888, 1961, and 2085. Then I realized that it was very important for me in the future. Mamalygin and his colleagues still had the confidence that the space flight authorities did not dare to take the risk to realize the full transition to the geostationary system. But this people did not yet understand who bad the economical situation was. The most optimistic opinion about this subject was that it would last at least until the year 2000 before the withdrawal of that fleet would take place. That this already in 1994 would be so far (with the exception of the Marshal Nedelin and the Nikolay Pilyugin) they did not believe. He showed me also the antennae in use for telemetry and radio telephony (voice communications) with manned space ships and stations. It was very difficult to visit the laboratories and make pictures. I plentyfully corrected this during visits to other tracking ships, about which I will write in the next paragraph. Mamalygin gave me a lot of information about other ships of the fleet and also about operations of his colleagues, he emphasized the significance of the involvement of his ship and the other ships with MIR-operations. He specified the other ships, for instance the Akadmik Sergey Korolyov, call sign ASK, almost 22000 Tons and further the 9000 tons ships Kosmonavt Pavel Belyayev, KPB, K.G.Dobrovolskiy, KGD, K.V.Patsayev, KVP, and the K.V.Volkov, KVV. And there were the smaller old boats of which the Nevel, often in the South Atlantic, was the most well-known. He spoke about the new ship Marshal Nedelin. The Nedelin had the honour to be involved in undockings of ships docked at the MIR-station. The ships positioned in the South Atlantic often were involved in return operations in later stages. Here the Nevel always played an important role. 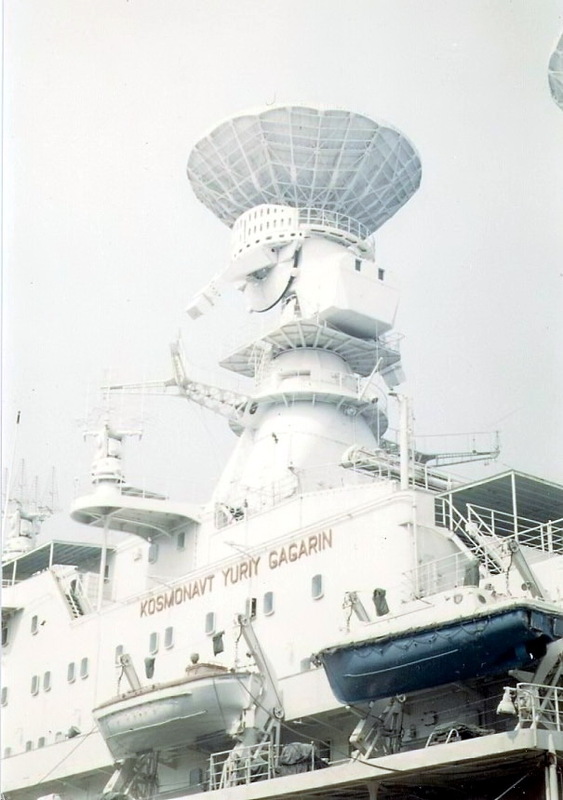 Mamalygin extensively spoke about the role of the ships during the first flight of the Buran. Ships of the atlantic group had to proceed to other positions. He believed that the K.V.Komarov had to be replaced. Until the MIR-operations in April of this year (1989) the K.V.K still was in the neighbourhood of Gibraltar. After this the ship had not been there and there came no other ship in that position. 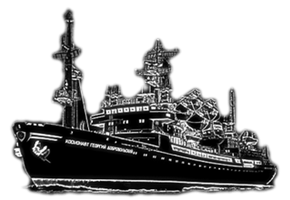 He spoke about the ship under construction, the Nikolay Pilyugin, the second ship of the Nedelin class, but he did not know whether or not this ship would replace the K.V.K. Details about the communications via shortwaves to and from the ships of the tracking fleet. The communications took place with CW (continuous waves) in Morsecode and also with Radioteletype (RTTY). The frequencies in use were 8.418, 12.627 and 16.837 Mcs. There were also day- and night frequencies: by day CW on 22.302 and RTTY on 22.220 Mcs, by night CW on 12.515 Mcs, RTTY on 12.522 Mcs. *) These 5 ships had been drawn from service between 1989-1990.